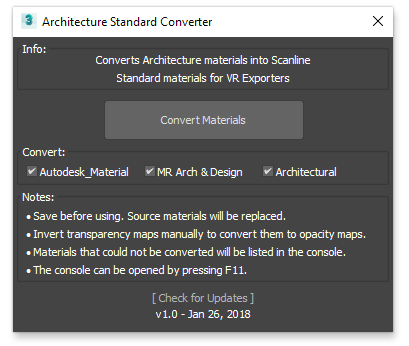 One of my next steps is to add in the now-fixed functionality of my Autodesk_Bitmap to Bitmap converter script, found as a general use stand-alone script here. Category: "# SmallpolyScripts" ButtonText: "ArchStd" ToolTip: "Architecture Standard Converter"
- Now a macroscript. Minor UI Tweaks. - Used felixherder's input to fix the material instancing problem. - Bugfix: Keeping the name should now work for multi-materials as well. Submitted by 1rv on Tue, 2017-06-27 00:40. Thank you for sharing! It's almost perfect, but there's one minor issue: it doesn't convert Autodesk bitmap to vanilla bitmap. Could it be fixed? I found there is your additional script to cure this issue but it does nothing. Submitted by enrico_sanchez on Wed, 2017-06-21 08:10. This script is the best! I searched for hours looking for a way to convert Autodesk Materials to V-ray materials. It looked like the only way was spending €99 on Universal Material Converter, but instead I used your script and then v-ray scene converter! Submitted by Smallpoly on Wed, 2017-05-10 12:33. Thanks for letting me know about this issue! If you know which material is causing the script to get stuck, do you think you could you assign it to a box, save that to a new Max file and upload it here as an attachment? If you're up for it, this would help me verify that any changes I make will fix the issue. Submitted by jointy on Tue, 2017-05-09 06:39.
thank you your script. 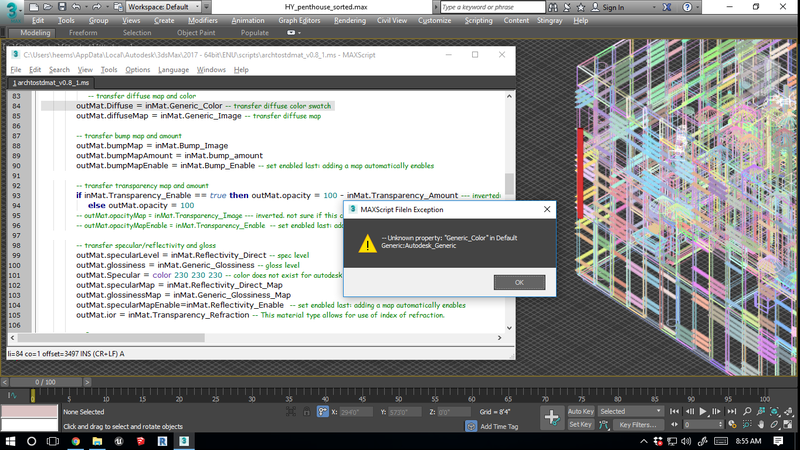 i am getting an error message "--unknown property: "generic color in default generic:Autodesk_generic"
Submitted by Smallpoly on Mon, 2016-12-19 04:11. Bugfix: Original names should stick around on all materials now.